Listen to Guardian interview with one of the 150 Nottingham occupiers. UK wide live coverage via the Guardian website: http://www.guardian.co.uk/education/blog/2010/nov/30/student-protests-live-coverage. BBC news : Tuition fee protesters in ‘cat and mouse’ with police. WATCH USEFUL VIDEO about week long occupation continuing in London. USEFUL LINK to UK-wide actions: http://libcom.org/news/november-30th-day-action-against-cuts-fees-30112010. NEW: Guardian round-up of 30th Nov action [long video]. 2. We demand that the University of Nottingham implement a complete open book policy in regards to existing budget constraints. GREAT HALL OCCUPIED AT NOTTINGHAM UNIVERSITY – as per above! 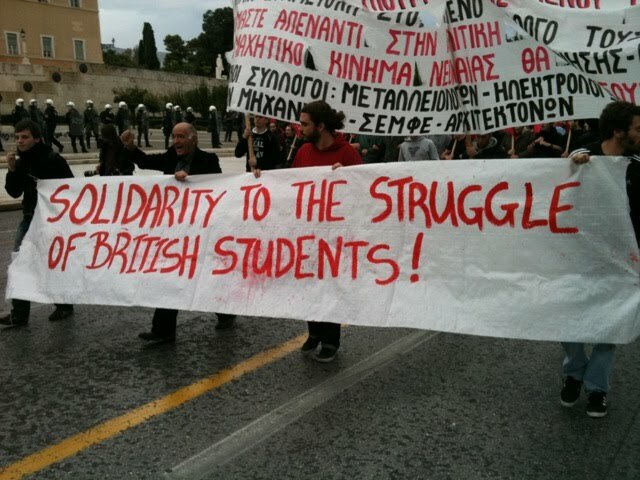 Thousands of students marching in London. Going down Whitehall the Police attempted to kettle them, students ran back and are now going down Oxford Street. Bus drivers honking horns in unison, chants of “Workers and Students – Unite and Fight”. Brighton and Hove have removed staff from offices in anticipation of demonstrations. Liverpool University roof occupied and banners hung. ITALY – Thousands marching in Rome, Genoa, Milan, Turin, Naples, Venice, Palermo and Bari. Chanting “They block our future, we block their cities”. Hundreds outside Vince Cable’s office in Twickenham chanting “Shame on you for turning blue”. 700 students have occupied Leeds University. Again! Hundreds marching in Sheffield to Nick Clegg’s office chanting “Nick Clegg we know you – You’re a ——- Tory too”. Three banks closed in Leeds anticipating occupations. 2,000 marching in Manchester. University occupation continues. UCU and PCS union members join march in Leeds. School and sixth form students walk out in Hardenhuish, Chippenham, more from Sheldon on their way to join. Edinburgh march with coffins “RIP Education” on the side. Several hundred marching in Bristol. Plymouth University in occupation for EIGHTH day. Many hundreds protesting in Colchester. This entry was posted in Events & meetings, Road to success and tagged city, cuts, education. Bookmark the permalink. As an alumna I’m proud of you lot. 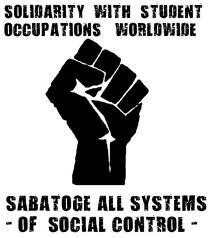 UoN isn’t known for its activism, so more power to you!